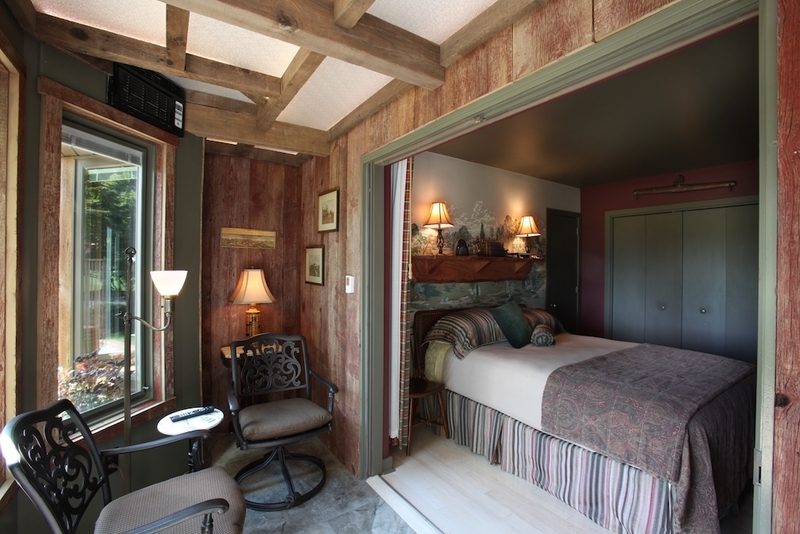 Traditional plaid and corduroy textiles combine in this huntsman style room. Shades of forest green, burgundies, and earth tones enhance the custom “fox hunt” wall mural. 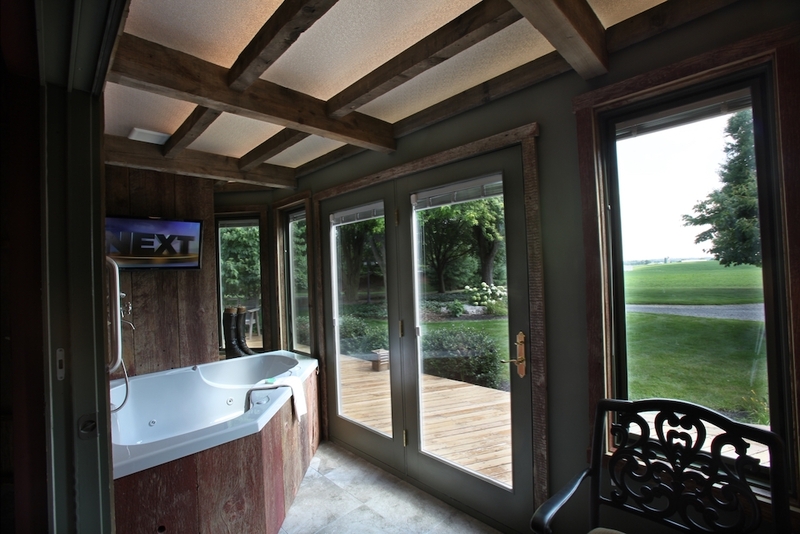 You are sure to feel like you are at a Swiss Chalet as you step into your own Jacuzzi tub in the attached private porch. Then, close your heavy curtains, turn on your fireplace and cuddle into this romantic Queen suite for the night. In the morning, enjoy a cup of coffee on the indoor porch or open your French doors to sit on the first-floor deck. Totally awesome B&B! The staff, room, & breakfast were all 1st class! 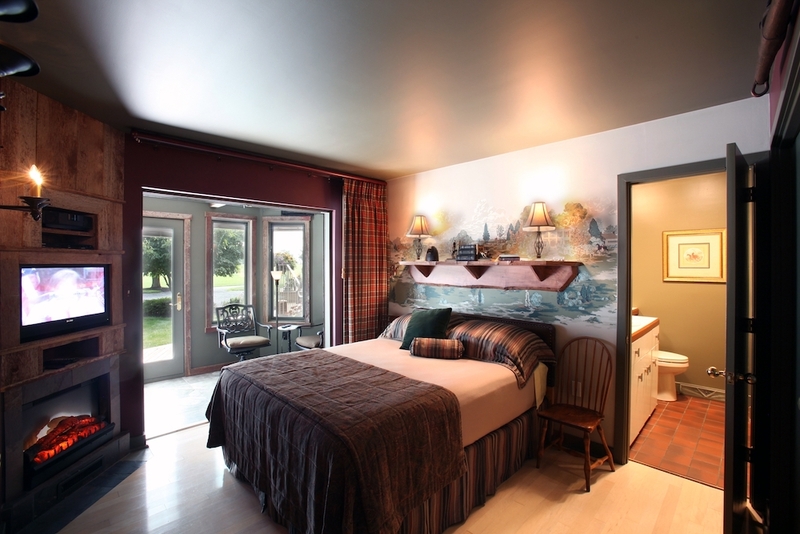 We love this room and the additions of the Jacuzzi & deck. Thank you! We’ll return for sure. So delighted we found this wonderful B&B. We enjoyed relaxing in the Jacuzzi tub while listening to music! The breakfast was delicious! We will certainly be back. Thank you Norm & Staff for your wonderful hospitality. It was our first time at this lovely B&B and by far our most favorite accommodation. The Fox Hunt is a very cozy room! Breakfast is to die for! Thank you so much for all your hospitality and all your attention to accommodate our needs. We will definitely recommend this to our friends and plan to come back! We can’t thank you enough for the amazing experience we’ve had this weekend. Not only was the room beautiful, comfortable and clean but the entire time you’ve helped us feel at home. We cannot wait to return and we are so happy to have met everyone here! This lovely first floor room, with rich burgundy and earth tones features a fox hunt wall mural and can be accessed from inside the house or from a private entrance direct from the patio. The bedroom, with en-suite bathroom and walk-in tiled shower, includes an in-room Jacuzzi tub with sitting area, heated floor and additional TV.